Homeownership “the best investment that an average person can make.” Still? Although the recession began in December 2007 and purportedly ended in June 2009, the report collects its data from 2,967 participants who were interviewed in May of 2010. Information gathered from the two groups, referred to as either the “Held their Own” or the “Lost Ground” group, reported drastically different results in most areas. While 35% of the Lost Ground group reported that they struggled to pay their rent or to pay the mortgage, the other group did not report any trouble in doing so. 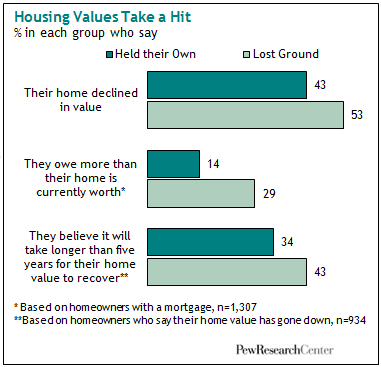 More than half (53%) of the Lost Ground group are homeowners and 42% of those homeowners said they have not paid half of what they owe on their home. 30% the of Held their Own homeowners (75%) agree.